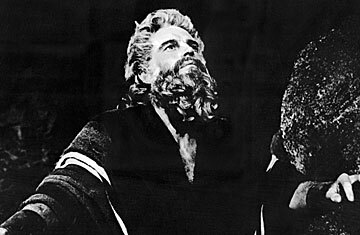 Charlton Heston as Moses in The Ten Commandments. God is dead. Charlton Heston, the man-deity of movies, passed away yesterday in Los Angeles at 83. Heston didn't just play great roles, he imposingly, thrillingly embodied them. Moses (in The Ten Commandments), Michelangelo (The Agony and the Ecstasy), Rodrigo Diaz (El Cid), Judah Ben-Hur in the Godzilla of Biblical epics: he slipped into these outsize figures as if into a second skin, stamped his strong visage on theirs. He also, actually, did play God once  in the 1990 Paul Hogan comedy Almost an Angel  but he had revealed his movie divinity long before that. With his regal posture, searing blue eyes, perfect jawline and a baritone voice bred for noble declarations, Heston was the ideal vessel for Hollywood grandeur. In the 1950s and 60s, the era of the movie epic  those three-hour extravaganzas with a cast of thousands and the passionate enunciation of high ideals  he was the epic hero; it's almost impossible to imagine the genre without him. To any of these films he added millions in revenue, plenty of muscle and 10 I.Q. points. "Charlton Heston is an axiom," the French film critic Michel Mourlet famously wrote in a 1960 Cahiers du Cinema essay so acute and fervid that we have to quote a bit more of it. "He constitutes a tragedy in himself, his presence in any film being enough to instill beauty. The pent-up violence expressed by the somber phosphorescence of his eyes, his eagle's profile, the imperious arch of his eyebrows, the hard, bitter curve of his lips, the stupendous strength of his torso  this is what he has been given, and what not even the worst of directors can debase... Through him, mise en scène [a film's visual strategy] can confront the most intense of conflicts and settle them with the contempt of a god imprisoned, quivering with muted rage." Whether the rage was muted or explosive, Heston was surely a movie Colossus, made to be seen on the wide screens that proliferated in the 50s. Or, even better, on a tall one  the CinemaScope frame should have been stood on its side to do justice to his star bulk, physically and psychologically. Beyond the stupendous torso, he gave the impression of thinking out his dialogue before he spoke it; he was a pensive glamour boy. Like fellow postwar stars Kirk Douglas and Burt Lancaster, he'd tense his neck muscles and speak in a sonorous growl that brought authority and menace to his speeches; he could make piety sound robust. But where Lancaster and Douglas were kinetic, bursting with restlessness, Heston was essentially static  not so much statuesque as a statue in some audio-animatronic hall of Heroes. He stood and he spoke. That's why screenwriters loved him as much as movie audiences did. He was a hero to them all. He became a villain to many in his later life, when he took up the strident support of conservative causes, most notably that of the National Rifle Association. But no one questioned Heston's personal integrity. Like the characters he played, he said what he believed in, remained faithful to those faithful to him. He was married to the same woman, Lydia Clarke, for 64 years. She was at his side when he died. He was born John Carter, on Oct. 24, 1924, in Evanston, Ill. (He would take his stage name from his mother's maiden name and his stepfather's surname.) At his hometown college, Northwestern, he played in student films as Peer Gynt and Marc Antony; already he was set in the heroic mold. In 1944 he married Lydia, also a Northwestern student, and joined the Army Air Force, serving two years as a radio operator. On Broadway in 1947, he played in Antony and Cleopatra with Katharine Cornell (who, the year before, had done Candida with the young Marlon Brando). He did early TV and soon was in Hollywood.